Stepping onto Blenkner Street and into history. 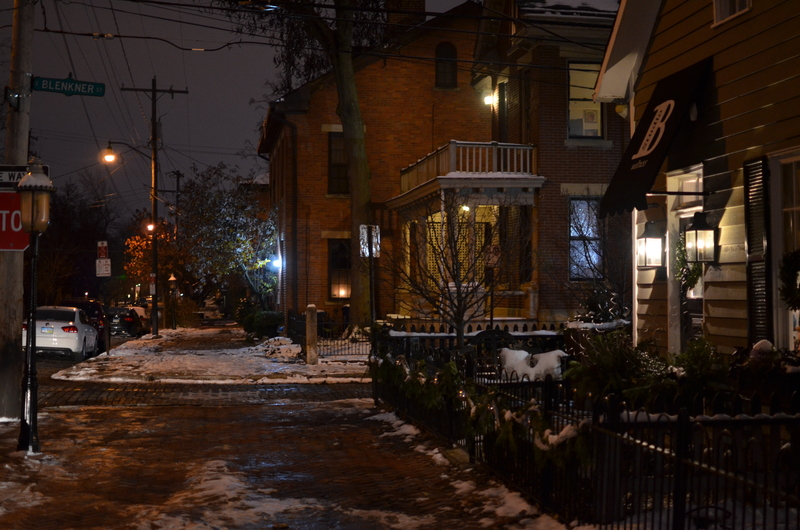 Columbus, Ohio’s wonderful German Village district, December 2013. 1/60 sec., f/1.8, ISO 800, 35mm. THE FAMILIAR ADMONITION FROM THE HIPPOCRATIC OATH, the exhortation for doctors to, “First, Do No Harm” has applications to many kinds of enterprises beyond the scope of medicine, photography among them. We are so used to editing, arranging, scouting, rehearsing and re-imagining reality that sometimes, we need merely to eavesdrop on it. Some pictures are so complete in themselves that, indeed, even minimal interference from a photographer is a bridge too far. Sometimes such images come as welcome relief after a long, unproductive spell of trying to force subjects into our cameras, only to have them wriggle away like so much conceptual smoke. I recently underwent several successive days of such frustration in, of all things, my own home town, fighting quirky weather, blocked access, and a blank wall of my own mental making. I finally found something I can use in (say it all together) the last place I was looking. In fact, it was a place I hadn’t wanted to be at all. Columbus, Ohio at night in winter is lots of things, but it’s seldom conducive to any urge more adventurous than reheating the Irish coffee and throwing another log on the fire. At my age, there’s something about winter and going out after sunset that screams “bad idea” to me, and I was reluctant to accept a dinner invite that actually involved my schlepping across the tundra from the outskirts to the heart of downtown. Finally, it was the lure of lox and bagel at Katzinger’s deli, not my artistic wanderlust, that wrenched me loose from hearth and home, and into range of some lovely picture-making territory. The German Village neighborhood, along the city’s southern edge, has, for over a century, remained one of the most completely intact caches of ethnic architecture in central Ohio, its twisty brick streets evoking a mini-Deutschland from a simpler time. Its antique street lamps, shuttered windows and bricked-in gartens have been an arts and party destination for generations of visitors, casting its spell on me clear back in high school. 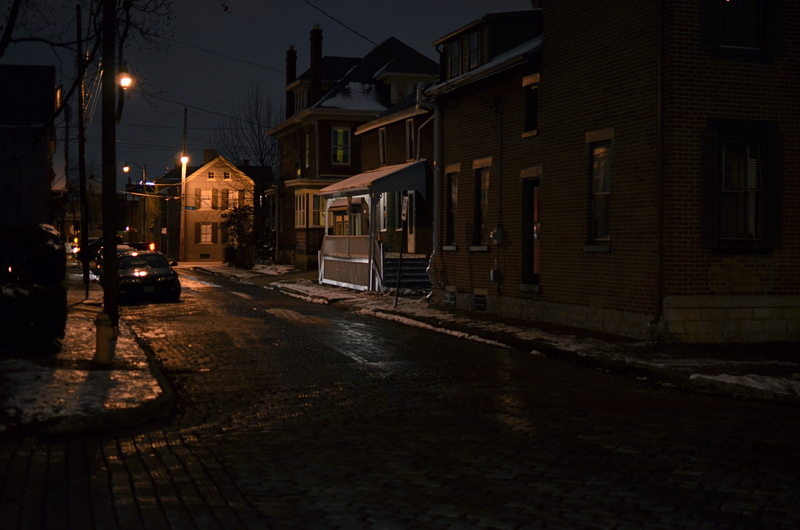 Arriving early for my trek to Katzie’s, I took advantage of the extra ten minutes to wander down a few familiar old streets, hoping they could provide something….unfamiliar. 1/60 sec., f/1.8, ISO 800, 35mm. The recently melted snowfall of several days prior still lent a warm glaze to the cobbled alleyways, and I soon found myself with city scenes that evoked a wonderful mood with absolutely minimal effort. The light was minimal as well, often coming from just one orange sodium-vapor street lamp, and it made sense to make them the central focus of any shots I was to take, allowing the eye to be led naturally from the illuminated streets at the front of the frame clear on back to the light’s source. Using my default lens, a 35mm prime at maximum f/1.8 aperture, and an acceptable amount of noise at ISO 800, I clicked away like mad, shooting up and down Blenkner Street, first toward Third Street, then back around toward High. I didn’t try to rescue the details in the shadows, but let the city more or less do its own lighting with the old streets. I capped my lens, stole away like the lucky thief I had become, and headed for dinner. The lox was great, too. Historic, in fact. This entry was posted on December 12, 2013 by Michael Perkins. It was filed under 35mm, Available Light, Composition, darkness, Depth Of Field, Noise, Prime lenses, Silhouette, Street Photography and was tagged with 35mm, Available Light, Columbus Ohio, f/1.8, German Village, Prime lenses, Street Photography.